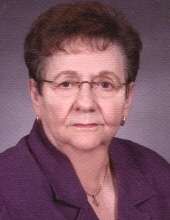 Mildred Swinson Renfrow, 86, passed away on Friday, February 8, 2019 at Kitty Askins Hospice Center. Mildred was born in Duplin County on February 3, 1933 to the late Grey and Bessie Sullivan Swinson. She was preceded in death by her husband of 66 years, Roy Thomas Renfrow. For many years, Mildred worked as a hairstylist in Goldsboro. Mildred was a member of Madison Avenue Baptist Church. The family will receive friends on Sunday, February 10, 2019 from 4:00 – 5:30 p.m. at Seymour Funeral Home followed by a service to celebrate her life in the chapel with Rev. Randy Outland and I.K. Williamson officiating. A private interment for the family will be held on Monday at Eastern Carolina State Veterans Cemetery. Mildred is survived by her daughter, Debbie Leigh Robertson and husband Garry; four grandchildren, Kelly R. Mendez and husband Mark, Travis Pate and wife Susan, Garrett Renfrow, and Ronni Renfrow; and four great-grandchildren. In addition to her husband and parents, she was preceded in death by her son, Ronald Thomas Renfrow. Flowers are welcome or memorials may be made to the Shriner’s Children Hospital, 403 E. Front Street, New Bern, NC 28560, Kitty Askins Hospice Center, 107 Handley Park Court, Goldsboro, NC 27534 or the charity of one’s choice. To send flowers or a remembrance gift to the family of Mildred Swinson Renfrow, please visit our Tribute Store. "Email Address" would like to share the life celebration of Mildred Swinson Renfrow. Click on the "link" to go to share a favorite memory or leave a condolence message for the family.